Analysis: In the wake of receiving the most guaranteed money for a non-quarterback in his new contract, Lawrence is slated for shoulder surgery Wednesday to correct issues that have plagued him multiple times in his five-year career. While the PUP list likely will be his home in late July and into August, the Cowboys believe he'll be ready for Week 1. 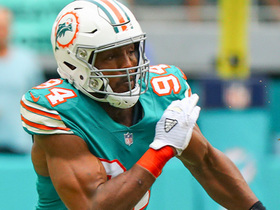 Once he gets the all-clear, Lawrence will lead a pass rush that now includes offseason trade acquisition Robert Quinn. Analysis: Lawrence and the Cowboys reached an agreement on a five-year extension Friday, so both parties undoubtedly want the Boise State product at 100 percent heading into training camp. Lawrence held off on surgery at first, using it as a bargaining chip during negotiations leading up to the extension. The 27-year-old logged 64 total tackles (42 solo, 22 assisted) and 10.5 sacks over 16 games in 2018. Analysis: Lawrence played under the tag last season without complaint, but he already has said he won't sign it a second time, per Tom Pelissero of NFL.com. 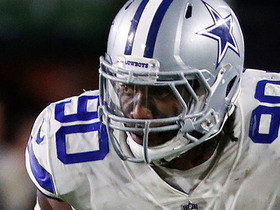 The Cowboys now will try to work out a long-term deal before the July 15 deadline, with their standout pass rusher recovering from offseason shoulder surgery in the meantime. Between the contract situation and his injury, Lawrence presumably won't step on a practice field any sooner than the start of training camp. Lawrence (shoulder) is unwilling to sign a second consecutive franchise tender, Tom Pelissero of the NFL Network reports. Analysis: Lawrence followed up a blow-up 2017 season with another quality effort in 2018 and has ultimately totaled 25 sacks over the past two years. Also proving durable after logging full, 16-game schedules in three of his past four campaigns, Lawrence will be among the hottest commodities of the 2019 offseason if he's allowed to hit the open market. Lawrence will undergo shoulder surgery this offseason, Jon Machota of The Dallas Morning News reports. Analysis: Lawrence didn't appear slowed by injury much this season as he tallied 64 tackles and 10.5 sacks in 16 games. He said he's setting a date with his doctor now and will have the surgery in the near future. It's unclear if the defensive end will miss any offseason work, but the procedure isn't expected to impact the 26-year-old's availability at all once the 2019 season rolls round. Lawrence finished the regular season with a career-high 64 tackles, including 10 sacks, while also recording two forced fumbles, one fumble recovery and his first career interception. Analysis: The disruptive defensive end didn't quite repeat his breakout 2017, but Lawrence still racked up double-digit sacks for the second straight season. 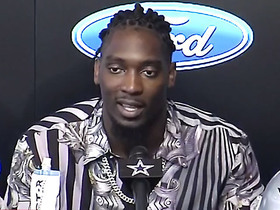 While his current contract is up, the Cowboys will almost certainly use the franchise tag on the 26-year-old if they can't come to terms with him on a long-term deal, assuring that Lawrence will be back in Dallas and leading the pass rush in 2019. Lawrence posted three tackles (two solo) and a sack in Sunday's win over Tampa Bay. Analysis: Lawrence brought his season sack total to 9.5, though Sunday's takedown of Jameis Winston was his first sack since Week 12 against the Redskins. The 26-year-old played 62 of 80 defensive snaps -- tops among defensive linemen -- and has 61 total tackles in 15 games. Lawrence had four tackles (two solo), a sack and a forced fumble in Thursday's 13-10 win over the Saints. Analysis: Lawrence had a strip-sack of Drew Brees late in the second quarter, but the quarterback was able to recover his own fumble to prevent the turnover. The 26-year-old has 51 tackles (34 solo) and 9.5 sacks with two forced fumbles and an interception in what has been a very productive season through nine games. Lawrence recorded three tackles, including half a sack, and his first career interception in Thursday's win over Washington. Analysis: He made Colt McCoy's Thanksgiving a miserable one, collecting two other QB hits in addition to his half-sack and helping to seal a Cowboys win with his third-quarter pick late in the third quarter, when he jumped and tipped McCoy's pass attempt to himself. Lawrence now has 8.5 sacks and 47 tackles through 11 games, putting him on pace for another strong campaign as he heads into free agency this offseason. Lawrence logged five tackles (three solo) and 1.5 sacks during Sunday's 22-19 win over the Falcons. Analysis: Lawrence now has eight sacks on the season. The 26-year-old excelled against Atlanta's struggling offensive line Sunday and played a key role in holding the Falcon's offense to only 19 points. Lawrence will look to log another impressive outing against the Redskins on Thursday. Lawrence recorded four tackles (two solo), one sack and one forced fumble during Monday's 28-14 loss to the Titans. Analysis: Lawrence was a rare bright spot in Dallas' defense, which allowed Tennessee's offense to post a season-high 28 points Week 9. The five-year pro's night began with a strip-sack of quarterback Marcus Mariota, arguably the Cowboys' best defensive play of the night. Lawrence will look to build upon his 6.5 sacks against the Eagles on Sunday. Lawrence (shoulder) is listed as active Sunday versus the Jaguars, Calvin Watkins of The Athletic reports. Analysis: Entering the day behind just Geno Atkins, J.J. Watt and T.J. Watt in the sack ranks, Lawrence will look to build upon his 5.5 sacks against a Jacksonville offensive line that has surrendered 11 takedowns of Blake Bortles in five games this season. 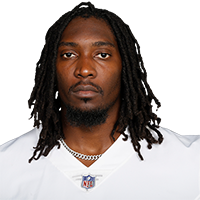 Lawrence (shoulder), who is listed as questionable for Sunday's game against the Jaguars, is expected to play, Ian Rapoport of NFL Network reports. Analysis: Lawrence wasn't able to advance beyond limited practice participation this week while dealing with a shoulder injury that could ultimately require surgery, but the star defensive end appears content to play through the issue. So long as Lawrence is active Sunday, he'll likely play a normal amount of snaps and look to get after the quarterback after he was held without a sack for the first time all season in the Week 5 loss to the Texans. Lawrence (shoulder) is listed as questionable for Sunday's game against the Jaguars, Jon Machota of the Dallas Morning News reports. Lawrence (shoulder) was a limited participant in Thursday's practice, Todd Archer of ESPN.com reports. Lawrence (shoulder) didn't practice Wednesday, Jori Epstein of The Dallas Morning News reports. Analysis: In the Cowboys' five games this season, Lawrence's share of the defensive snaps has wavered between 72 and 80 percent. That said, he was nearly blanked in the box score in Sunday's overtime loss to the Texans, logging only one assisted tackle. The limited output was perhaps the result of the shoulder injury, which impacted his practice reps last week. The issue has lingered into this week, but Lawrence remains hopeful to recover in time to add to his sack total Sunday against the Jaguars. Lawrence (shoulder) was a full participant in Friday's practice and will play Sunday versus the Texans, Jon Machota of The Dallas Morning News reports. Analysis: The Cowboys will benefit greatly from having having Lawrence, as he's already racked up 5.5 sacks in the first four games. The 26-year-old defensive end should be a top IDP option against a Texans' offensive line that ranks 28th in the league according to Pro Football Focus. 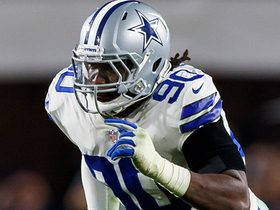 Lawrence was a limited participant in Wednesday's practice with a shoulder injury, David Helman of the Cowboys' official site reports. 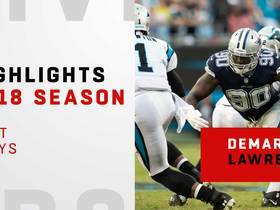 Analysis: Lawrence seemingly injured his shoulder Sunday versus the Lions in the midst of a dominating effort, as the defensive end posted eight tackles and three sacks in the victory. It remains to be seen how serious Lawrence's shoulder injury is, but we should know more as the practice week progresses. Lawrence racked up eight tackles (six solo), including three sacks, in Sunday's win over the Lions. Analysis: Lawrence's huge game gives him a league-leading 5.5 sacks through four weeks. Looking ahead, he'll aim to slow down Deshaun Watson and the Texans offense when the Cowboys head to Houston in Week 5. Lawrence recorded three tackles and half a sack in Sunday's loss to the Seahawks. Analysis: He's now gotten to the quarterback in all three games in 2018, and Lawrence is proving that his breakout in 2017 was no fluke. He could have trouble keeping his streak alive in Week 4, however, against a Lions offensive line that's allowed Matthew Stafford to be brought down only three times so far. Lawrence recorded two tackles, both solo, and a sack across 52 defensive reps in Sunday's win over the Giants. Analysis: Lawrence sat out of practice early last week due to a groin issue, but that didn't appear to slow down the defensive end on Sunday night. Lawrence recorded his second sack on the season. He'll look to keep the sack streak alive Sunday against the Seahawks. Lawrence (groin) was a full practice participant Thursday, David Helman of the Cowboys' official site reports. Analysis: The Cowboys kept Lawrence off the practice field Wednesday as a precaution, according to David Moore of The Dallas Morning News. With an uninhibited return for Thursday's session, Lawrence is good to go for Sunday's game against the Giants and the immobile Eli Manning, who he's sacked just 1.5 times in six career appearances. Lawrence didn't practice Wednesday due to a groin injury, David Helman of the Cowboys' official site reports. Analysis: On many occasions, a DNP is something to be worried about, but the Cowboys apparently held out Lawrence as a precaution Wednesday, per David Moore of The Dallas Morning News. Once he returns to practice and starts preparation for Week 2 against the Giants, Lawrence will be looking to keep up his standard from the start of the 2017 season (15.5 sacks in 17 games). Lawrence recorded seven tackles, including one sack and two other tackles for losses, as the Cowboys fell 16-8 to the Panthers. Analysis: Dallas' pass rush brought down Cam Newton three times in the game, with Lawrence leading the way. Coming off a 2017 season with a career-high 14.5 sacks, the 26-year-old seems poised for another impressive campaign, and he'll get to face another vulnerable offensive line in Week 2's tilt against the Giants. Lawrence did not reach a contract agreement with the Cowboys prior to Monday's 4:00 PM ET deadline for franchise-tagged players, Adam Schefter of ESPN reports. Lawrence signed the Cowboys' franchise tag Monday, Rob Phillips of the team's official site reports. Lawrence was franchise tagged Monday, Ian Rapoport of NFL Network reports. 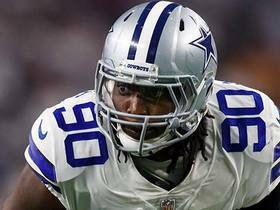 The Cowboys will use their franchise tag on Lawrence before the 3 p.m. EST deadline March 6, but plan to continue negotiating with the defensive end through mid-July on a long-term contract, David Moore of The Dallas Morning News reports. Lawrence's agent, David Canter, expects contract talks with the Cowboys to kick into gear at the NFL Combine in late February, ESPN reports. "It's really up to them to want to do a deal that's in line with what the market is for a young, ascending, elite franchise-caliber defensive end," Canter said. "Whatever that number ends up being remains to be seen. But I do imagine and believe that we'll have multiple conversations over the next month or so. I think it's early right now." Analysis: If the two sides aren't able to agree to a long-term deal, Lawrence will almost certainly get the franchise tag from Dallas, so there's little chance of him being in another uniform in 2018. The 25-year-old came into last season with nine career sacks, but he picked the perfect time to stay healthy and more than double that total, racking up 14.5 sacks in the final year of his rookie contract. Lawrence expects to return to the Cowboys in 2018, either after signing a long-term contract in the offseason or via the franchise tag, Todd Archer of ESPN reports. "I mean, I already know what my situation is," Lawrence said Monday. "I really don't care about it because I already know how the Cowboys feel about me, and they know how I feel about the organization. My agent will take care of everything, bro. He knows how it feels. He knows my right moves, so he'll do it." Analysis: The fourth-year pass rusher is due for a huge raise after recording a career-high 14.5 sacks in 2017, tying Calais Campbell for second in the league behind Chandler Jones. 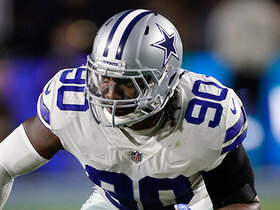 Getting Lawrence locked into a long-term deal is likely to be one of the Cowboys' top priorities over the spring, but with David Irving and Anthony Hitchens also headed for free agency, the team may not have enough cap space available to keep all of its key defensive personnel. Lawrence made two tackles and one sack in Sunday's 21-12 loss to Seattle. Analysis: It was his first sack in three contests. The four-year vet will be one of the few Cowboys with anything to play for Week 17 versus the Eagles, as he's just a half-sack behind NFL leader Chandler Jones. Lawrence (back) won't carry an injury designation into Sunday's game against the Seahawks, Gregg Bell of The Tacoma News Tribune reports. Analysis: Lawrence started the week not practicing but was able to progress to a full participant Friday to avoid the questionable tag. The 25-year-old could see additional attention with defensive tackle David Irving (concussion) ruled out for Week 16. Lawrence (back) practiced on a limited basis Thursday, David Helman of the Cowboys' official site reports. Analysis: There was tinge of worry surrounding Lawrence due to his absence from Wednesday's practice, but he allayed some of those concerns during media availability Thursday. According to Brandon George of The Dallas Morning News, Lawrence required the day off Wednesday in order to give his back some rest. With a capped session under his belt this week, Lawrence has set himself on a course to play Sunday against the Seahawks. 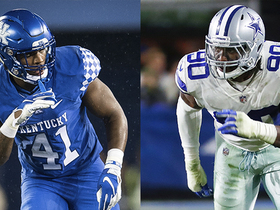 Lawrence was held out of Wednesday's practice with a back injury, David Helman of the Cowboys' official site reports. Analysis: Named to his first Pro Bowl team a day earlier, Lawrence is listed as a non-participant on the Cowboys' injury report for the first time all season. Given that Lawrence's 13.5 sacks account for 42.2 percent of the Cowboys' team total, a Week 16 absence would facilitate a significant matchup upgrade for Seahawks quarterback Russell Wilson. The Cowboys likely would turn to Benson Mayowa (back) and/or Taco Charlton to absorb most of Lawrence's snaps. 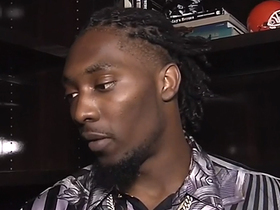 Lawrence was named to his first Pro Bowl team as a starter Tuesday, Jon Machota of The Dallas Morning News reports. Analysis: While he isn't bringing down quarterbacks as often as he was earlier in the season, Lawrence is still third in the NFL with 13.5 sacks -- not bad for a player who came into the year with just nine for his career. The fourth-year end has done an impressive job of padding his resume as he heads into free agency this offseason. Lawrence had four solo tackles, two sacks and one forced fumble against the Redskins on Thursday. Analysis: Lawrence played just 35 defensive snaps (58 percent) Thursday and was still able to post top-notch numbers. The fourth-year pro now has 13.5 sacks through 12 games, already shattering his previous career high of eight sacks in 2015. With the Giants coming to town in Week 14, Lawrence should have a great opportunity to post big numbers again, considering he accrued 1.5 sacks in their first meeting of the season, much before the drama started in New York. Lawrence (shoulder) was a full participant in practice Tuesday. Analysis: Lawrence was limited in practice Monday due to his shoulder injury but it doesn't appear like it will hinder him come time for the team's Thanksgiving game against the Chargers on Thursday. Lawrence (calf) was removed from the injury report ahead of Sunday's game against the Chiefs. Analysis: Lawrence was a full participant in Friday's practice after being limited both Wednesday and Thursday. The current NFL sack leader will now look forward to a date with a Chiefs defense that's allowed the 11th-most sacks in the league (22). Lawrence (calf) expects to play in Sunday's contest against the Chiefs, Drew Davison of the Fort Worth Star-Telegram reports. 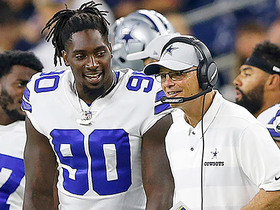 Analysis: The Cowboys capped Lawrence's activity level both Wednesday and Thursday, likely to ensure the pass rusher doesn't press his luck with a calf injury in tow. Assuming he gets the all-clear by the end of the week, he'll aim to build upon his NFL-leading 10.5 sacks Sunday versus a Kansas City offensive line that has conceded 22 sacks in eight games this season. Lawrence (calf) was limited in Wednesday's practice. Analysis: It's unclear when this injury was sustained since he just appeared on the injury report Wednesday. However, Lawrence's contributions this season have been second to none. The fourth-year defensive end just reached a double-digit sack count (10.5) for the first time in his career, and he's only played seven games. Keep an eye on him throughout the week as Lawrence should be a universally-owned IDP asset.